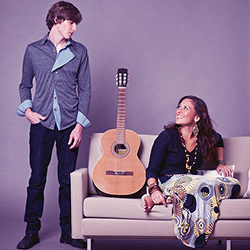 Monica da Silva and Chad Alger will perform a selection of their original compositions in English, Portuguese, and Spanish. The Brazilian American duo blend vintage-inspired Bossa Nova with Folk, and Indie Pop to form their self-coined Indie Nova genre. Monica da Silva and Chad Alger have been collaborating in music, and in life, since meeting in Chicago in 2007. Having lived in both the United States and Brazil, da Silva combines her two cultures into her writing, blending Indie Pop and Bossa Nova to form a new genre, one she calls Indie Nova. The duo's songs have been featured in the movie 'Lady Bird', in the BBC One series 'The Replacement', and on the Putumayo World Music compilation 'Brazilian Beat'. da Silva was just nominated for an International Brazilian Press Award for her latest single 'Soldado de Amor'.